Shaomi's 5G phone ready, MI will show the demo shown in MI Mix 3, will be equipped with Qualcomm's most powerful chipset - mobilereview.online - The Ultimate resource for mobile phones reviews, specification, information. Qualcomm has just released its new Chipset Snapdragon 855 in Tech platform yesterday. Qualcomm's chipset comes with 5G network support. In the last few days, companies such as OnePlus and Sony have announced to present their 5G smartphone. But it seems that in this race of 5G, Shaomi will be the first to beat. While other tech companies are now engaged in the creation of their 5G smartphone, Shaomi has also introduced its 5G support smartphone. Though Shaomi has not yet furnished his 5G phone, but the company's Mi Mix 3 5G phone has been seen publicly before the launch. Photo of Shawmi Mi Mix 3G 5G is getting viral on the internet. This photo is not a leak, but a showcase phone. Shomami Mi Mix 3 5G has been mourning with marketing pamphlet. Details of phone specifications and features in this pamphlet have also been written. On seeing the photo it is clear that I have made a photo of a MI mix 3 5G showroom where this phone is displayed publicly. I have also written the specification of this phone along with the photo of Mix 3G. This pamphlet has revealed that this phone from Shaomi will run on Qualcomm's Snapdragon 855 chipset. At the same time, this phone will also be given a X50 modem which will equip this variant of Mix 3 with the ability to support 5G. This pamphlet of Shaomi has also been told that MI will be able to give the download speed of Mix 3 5g model up to 2 gbps. This phone of Shaomi has been made on Bezel Lace design. The body has a very light body part around the phone. MI has not given any physical buttons on the front panel of the mix 3 5G phone. There is no notch on the phone's display. On seeing the photo of the phone, on the one hand, it has become clear that Shaomi will equip this phone with its fingerprint sensor, and on the other hand, for the phone's selfie camera, just like Mix 3, MI also be given slider panel like mix 3 in the mix 3 5G model. Shaomi Mi Mix 3 5G can be seen ready for a complete sale in this photo. 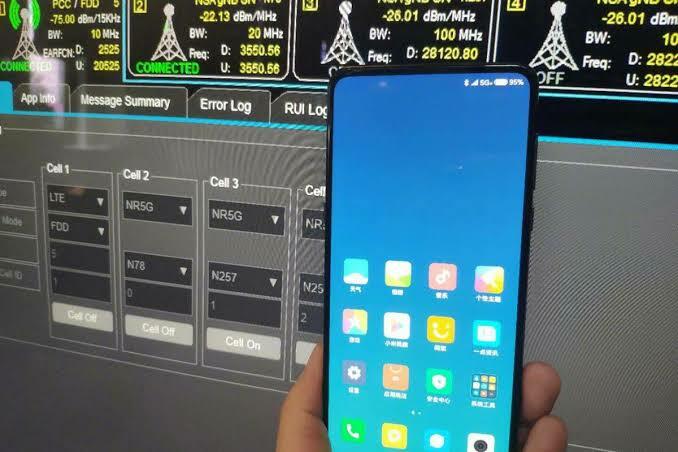 On the one hand, while other Tech company is presenting prototype of its 5G support phone, the phone with this 5G support from Shaomi can be seen completely ready. It will not be wrong to say this coming in front of this photo. Shaomi can launch this phone on a tech platform by announcing the launch date of Mix 3 5G on any day. If this happens, the Mix 3 model will be the world's first 5G support smartphone equipped with the Qualcomm Snapdragon 855 chipset.